Get down to business with this business tote bag! This 90 gram non-woven material carrier features reinforced 26" straps, interior pen pockets, deep exterior pockets and a mesh side pocket. This item has 4 1/2" gussets and is up to 20% reusable/recyclable. Use this great product as a company prize during your next promotion. This item is available from various bold colors. 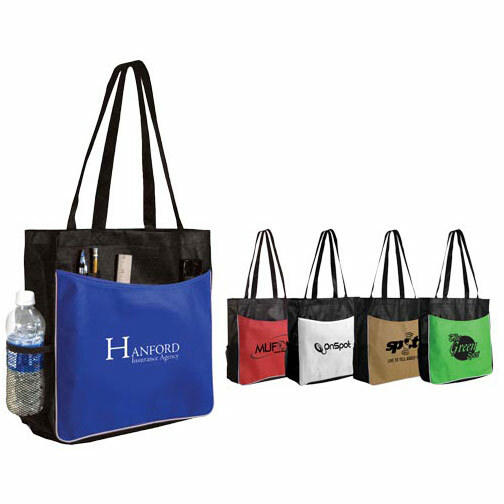 Select yours today for a fantastic way to promote your company. Size: 13.5 " x 14 "
Imprint Size:10" W x 7-1/2" H. Due to material, detailed logos and fine type are not recommended. Screen/Halftones are not recommended. Highest frequency possible is 28 lpi.